News! UCM now has a Calendar system, more details on the blog. 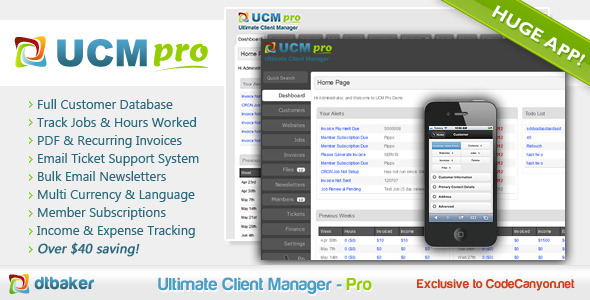 This is a free update to all UCM Pro buyers – enjoy! Responsive Bootstrap Admin theme now available as part of UCM Pro! Files as URL or Upload, Job Deposits, Linking Finance Items to Jobs. (Jan 2013). Newsletter Link Tracking, Support Ticket FAQ, Tabbed Dashboard Alerts. (Dec 2012). Email Quotas, Finance Reports, Job Emailing, Customer Subscriptions. (Nov 2012). Choose an Invoice Renewal Date and UCM will email automatic PDF invoice renewals and overdue invoice reminders. Cool! Manage your customer database. Store, search and group customers. Import from CSV. Keep private notes. Multiple contacts per customer. Fully open source PHP code. No encrypted obfuscated tricky stuff here. Change the code to suit your needs or create your own in house UCM plugins. The UCM system will show a list of active user sessions and allow the administrator to terminate any active user sessions. This is a great security feature incase you forget to log out on another computer. Choose an Invoice Due Date and UCM will email automatic PDF overdue notices if the invoice hasn’t been paid. Pro or Lite – what is the difference? The Ultimate Client Manager Pro Edition has been in the works for years. Simply put, it is a package including the very popular Ultimate Client Manager Lite Edition along with ALL available plugins. This gives you a saving of over $80! As more plugins are created (see our website for future plans) any UCM Pro users will receive a copy of them absolutely free. Wow! Don’t need all these features? Simply get the Lite edition and the individual plugins to suit your needs.